Ivan Hirst was born on the 4th March 1916 in Saddleworth, Yorkshire. 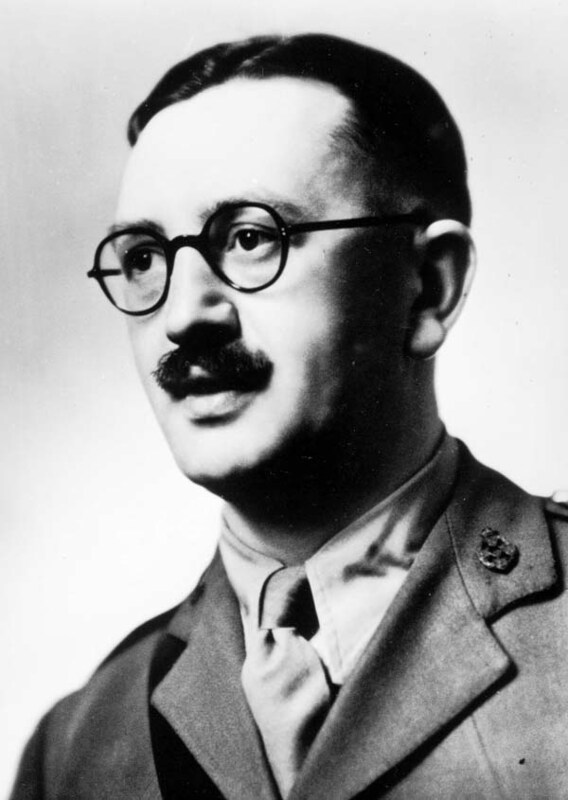 Hirst Joined the Territorial Army and by 1939 had reached the rank of Captain. In 1940 Hirst was promoted to Major while serving with the British Expeditionary Force and then in 1942 transferred to the newly formed REME (Royal Electrical & Mechanical Engineers). Towards the end of the second world war, the huge factory set up to produce Hitlers 'Peoples car' was in ruins, bomb damage from the daylight bombing raids was extensive. The Russian ground troops were the first to stumble on the factory after crossing the Mittelland canal but were not interested in it, next the US army but again it held no interest. Colonel Charles Radclyffe was looking for a workshop that could carry out much needed repairs to the alied transport and sent Major Ivan Hirst to check the factory out for suitablility. Major Hirst quicky realised the potential of the factory, especially after they cleared some debris from the generating plant building and discovered it had been put there to disguise the fact that it was still operational. Amongst the debris the British found a Beetle, it occurred to Hirst that this car could be made in the factory and used as much needed transport by the allies. Hirst had the car painted Army green and sent it to the Army HQ at Bielefeld. Shortly afterwards he received an order for 20,000 cars. 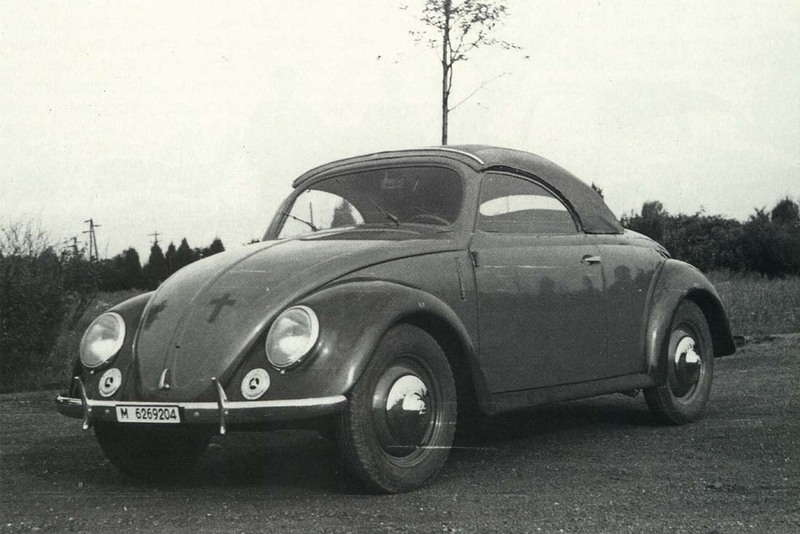 Production of the Beetle started but raw materials were in short supply and it was a constant struggle to source the steel, the glass & the tyres. On many early cars from this period, it was not possible to buy sheets of steel large enough to press the roof section - the solution was to weld two sheets of steel together, and this seam is sometimes visible on the inside of the roof of surviving cars. Malnutrition amongst factory workers was also a big problem as food was also in short supply, so the lawns next to the factory were turned into vegetable gardens to grow extra food. 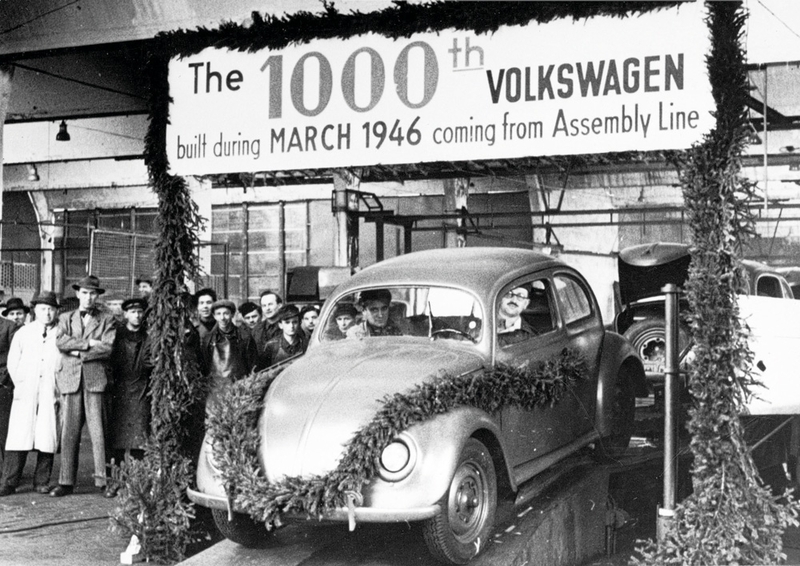 In March 1946, the British Army had produced its 1000th Volkswagen. With Hirst Superior Colonel Radclyffe`s approval, a barter deal was set up with many suppliers, exchanging completed cars for parts supplies. 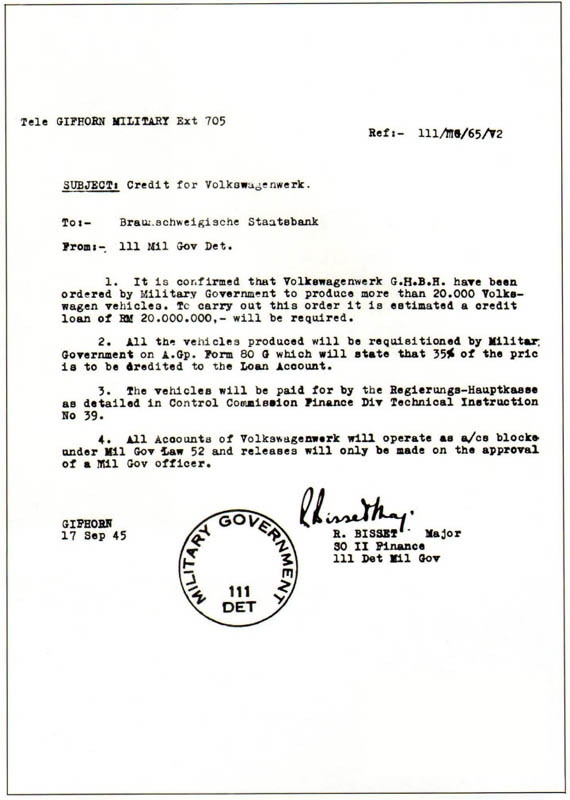 This sparked rumours that there was a black market in VW's being run by the British Army. Other car manufacturers in Germany were in the American controlled sector and not allowed to make cars, the US were of the opinion that German manufacturing should be suppressed for at least five years so that they were no longer a threat. 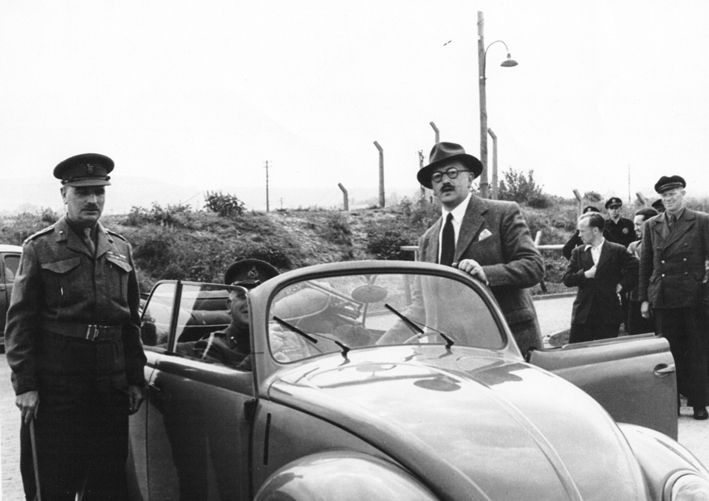 The British Government in London started hearing of this 'Black Market' in Volkswagens and appointed an Industrial Lawyer Dr. Herman Munch to take charge of Volkswagen. Although Dr. Munch was allowed access to the factory, Major Hirst refused to take orders from him. The Royal Military Police was instructed to investigate, after a 6 week investigation it was found that everything was legal and in order. Major Ivan Hirst's bookeeping was faultless, with every transaction correctly recorded, every car made had serial numbers and paperwork and each barter deal was legal and recorded. Hirst knew that building a successful car manufacturer would be incredibly difficult with just a single model, so some prototype variations were commissioned. One was a 4 seater convertible very similar to the pre-war convertible and the other was a two seater roadster convertible. The two-seater was built using a modified front bonnet over the engine, this car became the regular transport of Colonel Radclyffe and the car gained the nickname 'the Radclyffe roadster'. The roadster became the template for the commercially available two seater convertible made by Hebmüller and the four seater the basis of the Karmann cabriolet. In May 1949 – VOLKSWAGENWERK AG was formed and then in October '49 the Volkswagen factory was officially handed back to the Germans under the leadership of Heinz Nordhoff. At the end of 1951, Major Hirst was demobbed and returned to civilian life in England. Ivan Hirst died on 10 March 2000 aged 84. There is a road near the VW factory that was named after Hirst in appreciation of the work he did to save the Volkswagen factory. 27624503 page views since 8th October 1999. There are currently 151 users on the site.